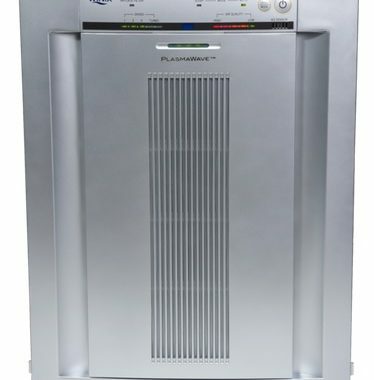 The Germ Guardian AC5000 3 in 1 True HEPA air purifier with UV Sanitizer and odor reduction is one of the best sellers. This air purifier costs around $100 to $150. 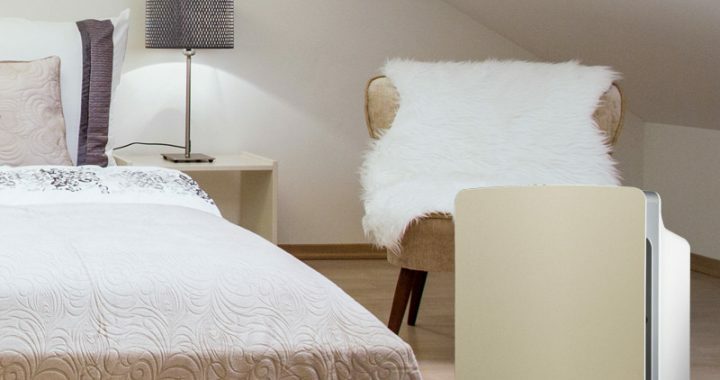 The Germ Guardian AC5000 is recommended for rooms up to 190 square feet (18m). The Germ Guardian AC5000 looks similar as it’s smaller model best seller AC4825. The AC5000 is also slim and sleek, it is a bit higher than a smaller brother. The height is 28 inches (71cm). Best place for this air purifier is a floor, it very well fits in a corner. Because of the air inlet and outlet, leave space (at least 1 foot) between the wall and air purifier. An air purifier is a very lightweight, only 10.55 lbs (4.8kg). So you can easily move it from space to space. Carrying handle makes it easier. This air purifier works with a fan – dirty air is sucking through filters. Pre-filter captures large particles and low household odors. 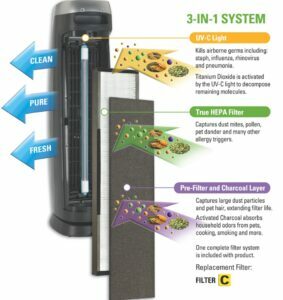 The True HEPA captures 99.97% of airborne allergens down to 0.3 microns in size. So it means dust mites, mold spores, pollen, pet dander. UV-C light works to kill airborne germs and bacteria. And this air purifier works very well, you will feel changes in the air in 10 minutes. The air feels noticeably fresher. The control panel is easily accessible, it is on the top of air purifier. The control panel is very simple – UV-C bulb button and power knob which switches air purifier on low, medium and high mode. The Germ Guardian AC500 is quiet only on low setting. The medium is also good but too loud during the night. The highest speed is quite loud. Not the loudest air purifier which uses a fan. Germ Guardian AC5000 is recommended for rooms up to 193 square feet. Let’s say regular ceiling height is 8 feet. 193×8=1544 cubic feet. Next, just calculate how much time it takes to cover all room. The air purifier cleans all room air 6 times per hour. Good result. You will have to change filters every 6 to 9 months. That’s individual. There is no filter change indicator so you will have to look at the filter. If the filter is white, it is ok. If the filter is dark gray or black, you should replace it. To elongate filters life, you can clean lint and dirt from filters regularly. Pre-filter and HEPA filter comes together and costs approximately $30. So that would be $60 in a year. Filters change is simple. Remove the back filter cover, pop out the used filter, and install a fresh one. The UV-C Bulb should be replaced every 10 – 12 months depending on use. On the high setting, Germ Guardian AC5000 consume 58W plus 5W bulb. Together – 63W wattage. That is less than your PC or TV. A little bit more than a fridge. 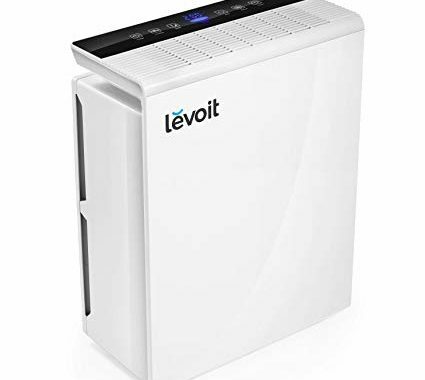 Very good air purifier, great price/performance ratio. It costs between $100 and $150, delivers clean air in 10-12 minutes (if used in recommended size room), saves space, lightweight, easy control panel. Ideal for allergy and asthma sufferers, and low household odors elimination. The plastic smell when using it the first time. I recommend to turn it on highest speed with the UV-C light turned on for 48 hours. Click here to see how GermGuardian AC5000 looks compared to its competitors. Posted in Air Purifier Reviews, Reviews and tagged Air Cleaner, Air Purifier, Germ Guardian AC5000, True HEPA.